Dr. Kishnani & Gabriel Meet! From the moment I began to understand what Pompe Disease is and what form of it my son has, I’ve protested the term “Late Onset Pompe Disease.” While I’m no doctor, I know the effect words have on people. In my mind, I picture a room with harsh lighting, sparsely furnished and smelling of burnt coffee. What I would give to turn back the clock and be invited to that room, where I imagine scientists, doctors, geneticists and just overall brilliant minds met and decided, “Let’s go with Late Onset Pompe or even call it Adult Onset Pompe.” By no means do I mean disrespect. After all, these are the brilliant minds keeping our Pompe Warriors living and living well! And, perhaps, they didn’t know in the Naming Meeting just how early signs of this “late” form of Pompe can show up. I tell people not to let “late” fool them. “Late” can mean symptoms show at seven days of age, seven months, seven years or not until seventy years after birth! Every case is different. Everyone is different. Had I been in that room, I would have taken out “Late” and “Adult” and thrown them in the bin along with the burnt-coffee-filled-styrofoam cups, begged and pleaded for forgiveness then ANY OTHER words to fill the blanks. “Anytime Onset Pompe Disease,” “Post Birth Onset Pompe Disease,” “Baby to Adult Onset Pompe Disease,” to name a few. None are flashy (keeping with the sterile environment in my mind!) but all are more accurate. I want to share this written interview done by folks with the company Baebies, which has developed technology and products to identify genetic mutations and differences in newborn screens as well as pediatric testing. 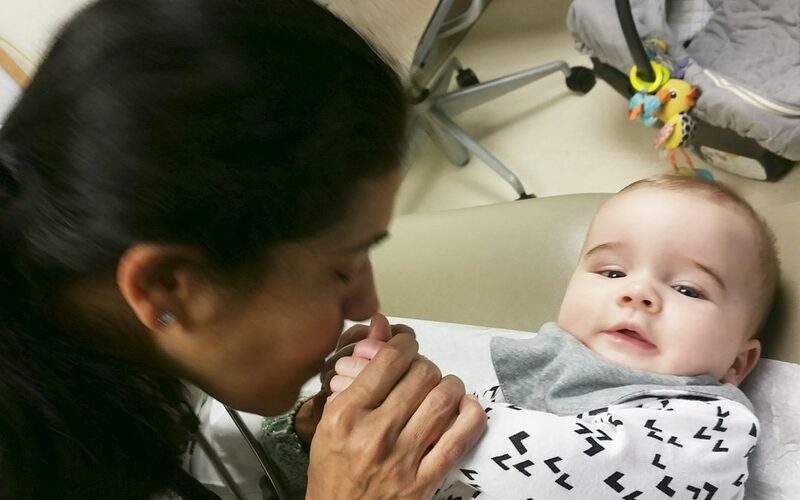 They spoke with one of the lead doctors and researchers in Pompe Disease, Dr. Priya Kishnani, about the importance of screening newborns for Pompe (this is how we found out Gabriel has it) for early intervention and/or treatment. 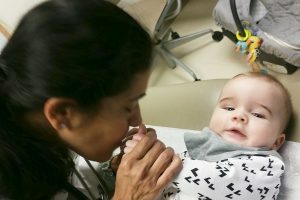 In a much more gracious manner, Doctor Kishnani explains how important it is for doctors and decision makers look past the nomenclature and toward screening newborns for Pompe in all 50 states. Ultimately, the only thing potentially “Late” in Late Onset Pompe Disease is a diagnosis that comes after muscles are compromised, smothered and lost. It’s so important to find this and fight this early, before it is too late. So, with more grace, more experience in the Pompe community, more clout and more education, Dr. Kishnani is saying….